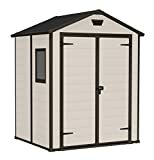 When you need to create a secure space within your garden where you could store your essentials including your large garden equipment and accessories as well as bicycles then you will find plastic garden storage sheds to offer you the most cost-effective solution. Plastic outdoor storage sheds are easy to work with as they are lighter compared to other materials. Here is a list of the most popular ranges that you might want to pick from. Ideal for Storing two 240L wheelie bins, gardening equipment, garden furniture or BBQ. Made Of Plastic(Polypropylene) with a capacity of 1200L and 2 Lockable Doors(padlock not included). External dimensions: (H)125, (W)145.5, (D)82cm - Internal dimensions: (H)110, (W)132, (D)76cm. Piston-operated lid, two front doors for easy access, lid-lifters for hands-free opening of council bins, floor included, wood-look texturing. INCLUDED: Our own e-book with professional tips on how to protect your lawn throughout the year.